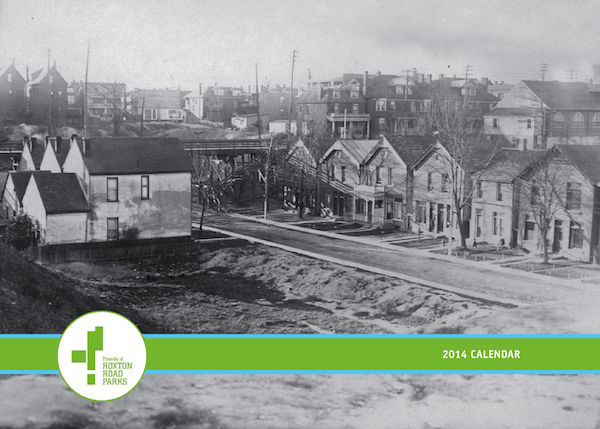 Back for a second year, we have a beautiful 2014 calendar featuring historic photos of our neighbourhood available for sale, just in time for holiday gift giving!The 12-month calendar includes historical photos and maps from the City of Toronto Archives showing what the neighbourhood around our parks looked like in times gone by. See what College Street, Dundas Street and the remains of Garrison Greek looked like in the 1900s. Priced at just $10, the Friends of Roxton Road Parks 2014 Calendar is a great gift for those on your list as well as for you and your family. This limited-edition calendar is printed on FSC-certified paper and includes historic photos and maps courtesy of the City of Toronto Archives. Proceeds from the sale of the 2014 Friends of Roxton Road Parks calendars support the work of the History Sub-Committee in sharing and celebrating the heritage of our parks and neighbourhood. 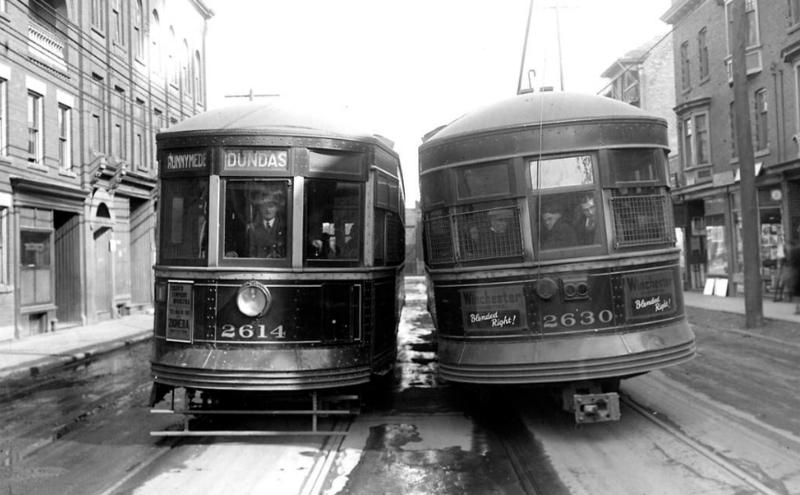 Dundas St, west of Ossington Ave, showing streetcars on sunken track, due to sewer construction, March 1931. Click here to visit our ShopLocket page and order your calendar now! We accept cash and major credit cards via Paypal (you do not need to have a Paypal account to order). Once you order, we’ll contact you to arrange local Toronto pickup or delivery. Calendars are also available at The Tampered Press for $10, cash only. The Tampered Press is located at 256-B Crawford (Dundas and Crawford, entrance off Dundas Street) — just ask for the calendar at the counter. Thanks to Caitlyn and the staff at The Tampered Press! Lastly, calendars may be ordered by emailing susan@utopia.ca or danielle@utopia.ca directly, or by calling 416-535-6710. We’ll make arrangements for delivery and payment upon ordering. Order early! We printed a limited quantity and the uniqueness, quality and price will make this special calendar sell out! Join Mike Layton this Thursday, December 5 for the Ward 19 Budget Town Hall. City of Toronto staff will present the proposed 2014 City Budget. This includes both your property tax rate and funding for important public programs and services such as child care, libraries, our roads, transit, shelters, and more. For more information, including infographics explaining the proposed budget, click here. The Garrison Cottages were once located within a parcel of land that stretched, south of Queen, between Peter Street and Roncesvalles. Remnants of these single story houses, built in the mid 1800s, remain. 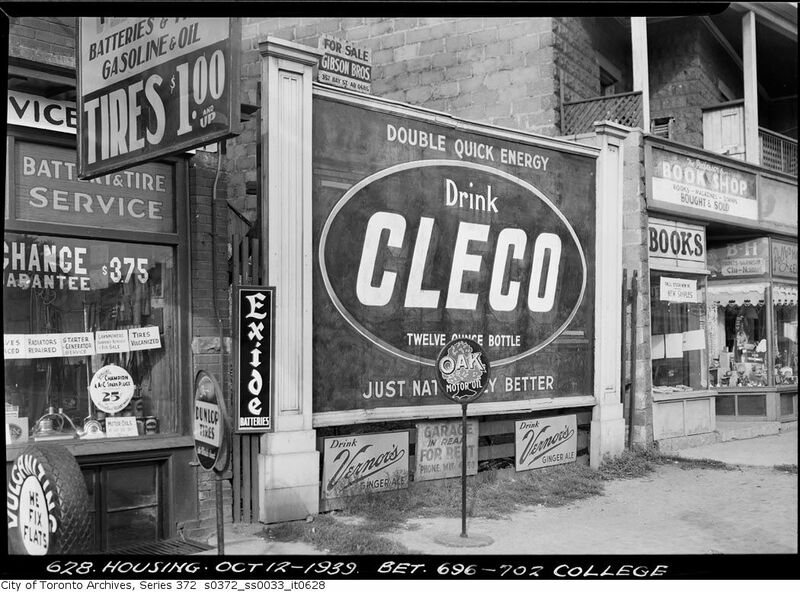 Click Here to visit Lost Toronto‘s Garrison Cottages post to learn more and see amazing pictures of the buildings from the 1800s up until today. Join the Ossington Community Organization for their “Thank God It’s Over cocktail party and fundraiser!” Come out and get the lowdown on what happened during the OMB trial, help the OCA pay their debt down and enjoy the sounds of Neil Clark. When? Saturday 7 December 8PM-12:30AM. Where? Artscape Youngplace, 180 Shaw, Gold Room. What? Cocktails! Fundraising! Merriment! and Argyle Street’s very own rock-jazz guitar god Neil Clark (neilclark.com). Why? The OMB trial for “109OZ” wrapped up on 15 November. Although, we don’t know the results yet, it seems like we might have done pretty well.